Using agile methods and the tools of Visual Studio 2010, development teams can deliver higher-value software faster, systematically eliminate waste, and increase transparency throughout the entire development lifecycle. Now, Microsoft Visual Studio product owner Sam Guckenheimer and leading Visual Studio implementation consultant Neno Loje show how to make the most of Microsoft’s new Visual Studio 2010 Application Lifecycle Management (ALM) tools in your environment. 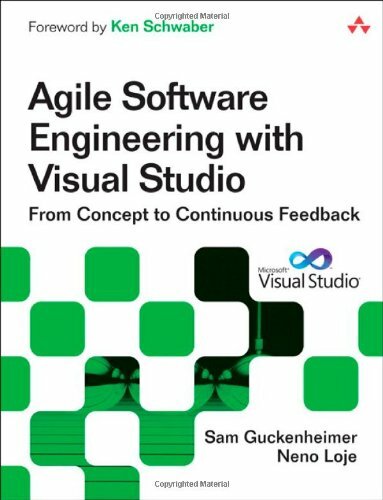 This book is the definitive guide to the application of agile development with Scrum and modern software engineering practices using Visual Studio 2010. You’ll learn how to use Visual Studio 2010 to empower and engage multidisciplinary, self-managing teams and provide the transparency they need to maximize productivity. Along the way, Guckenheimer and Loje help you overcome every major impediment that leads to stakeholder dissatisfaction—from mismatched schedules to poor quality, blocked builds to irreproducible bugs, and technology “silos” to geographic “silos.” Whatever your discipline, this book will help you use Visual Studio 2010 to focus on what really matters: building software that delivers exceptional value sooner and keeps customers happy far into the future.